Backing up Dolibarr involves two steps: backing up the documents directory and backing up the Dolibarr database. To backup the documents directory, make a copy of the documents directory (usually /opt/bitnami/apps/dolibarr/documents) as a ZIP or TGZ archive and then download the archive to your desktop. Select the “System Tools -> Backup” menu item. Click the “Generate backup” button. The backup process will now begin and the backup file will be saved to the server. You should also download the backup file to your desktop. 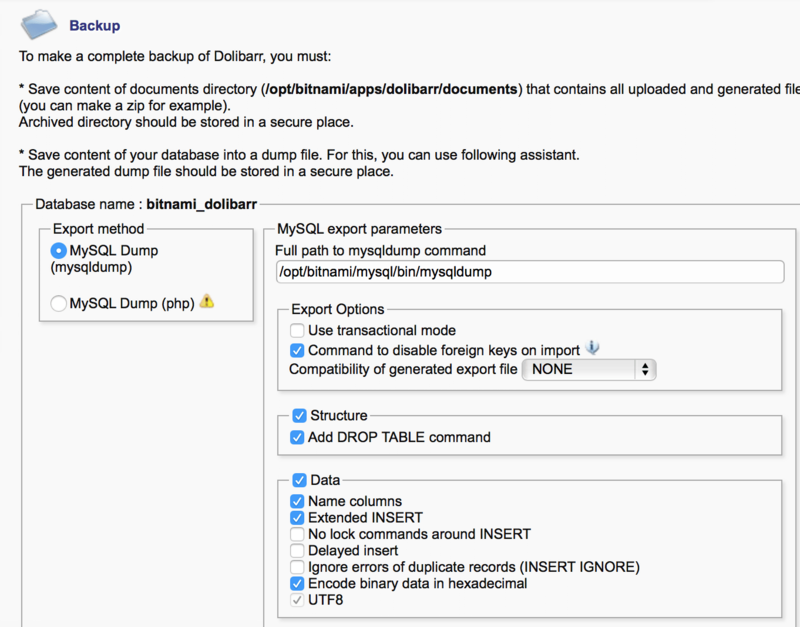 To restore Dolibarr, you must separately restore the documents directory and the database. To restore the documents directory, simply extract the contents of your ZIP or TGZ backup archive to the documents directory of your Dolibarr Stack installation (usually /opt/bitnami/apps/dolibarr/documents). Select the “System Tools -> Restore” menu item. Copy the content of the “MySQL import” field. Upload your database backup file to the server. Execute the command from the “MySQL import” field, remembering to replace the password and database backup file name and path with correct values.